Drip Irrigation Systems are a type of irrigation that make use of many drippers or emitters, which release little amounts of water directly to the roots of crops and plants in the garden. This system of watering a lawn, garden or field will save you a lot of effort and time over doing this manually with a hose. It will also save water, which is a great resource for the environment. Drip Irrigation Systems consist of polyethylene or vinyl tubing installed in between emitters, which distribute water to the needed areas. These emitters will be placed around your plant or crop in the garden to direct water to the root systems while minimizing waste of water. A good feature of drip irrigation systems is that they are 90% efficient and are more environmentally friendly than sprinkler systems whose efficiency is said to be 75%. The low installation cost and the efficiency for delivering water makes it suitable to be used for lawn drip irrigation systems. The incidence of disease can also be reduced using drip irrigation systems. It is difficult for the plants to be affected by disease because the sprinkled water does not settle on the leaves but directly on the root system. There are several different garden watering systems to choose from. Making use of the appropriate watering system is very important to the cultivation of a successful garden. The difference in the different types of garden watering systems lies in the method used in applying water. Water is equally important to a seed or a plant just as it is to our bodies. If a seed is left dry, it will not germinate and a plant will die off if it gets dry. Subsurface drip irrigation system is a high efficiency low-pressure irrigation system which uses buried drip tubes to provide the water needs of crops. Since 1960 this flexible system of irrigation has been used for irrigated agriculture and has been developing at a fast pace since the last two decades providing frequent light irrigations. It is suitable for windy, arid, semi arid and hot areas with little supply of water. Subsurface drip irrigation system improves yield and saves water by eliminating the evaporation of surface water and minimizing the occurrence of weeds and diseases. Water is not supplied to the soil surface but directly to the root of the plant thereby reducing the germination of weeds and reduces weed pressure on crops. 1. Have a Plan of how you are going to direct water to each of the planting beds. Put into consideration the distance to the available water source, whether the beds are raised or not. 2. Keep expansion in mind and on time but start small. If the system needs to cover a large area, divide the job into manageable parts. If you are starting a new bed, consider adding the system before or during planting. This is easier than doing it afterwards. 3. Organize the parts properly. The drip system has a lot of parts need to put it in place. You can eliminate unwanted trips to the store by knowing how many drip hose you have left or how much of each parts you have. Get a plastic bin with a lid to put all the parts in so that when it is time to add or fix any part, all you need follows you to the garden. How Can I Plan Drip Irrigation Systems for My Garden? 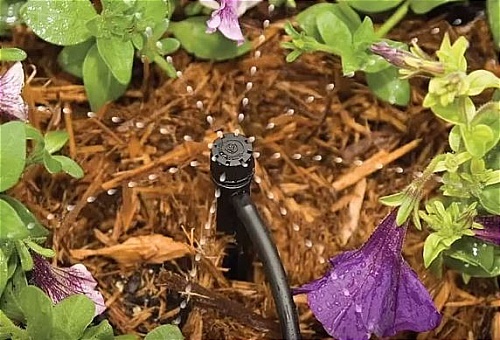 Where To Get the Best Deal on Drip Irrigation Supplies? What is drip irrigation? It is the slow and systematic application of water to a plants root. The delivery system utilizes a prong that is inserted directly within the root zone so that water is not wasted by being dispensed to non essential areas in the soil.